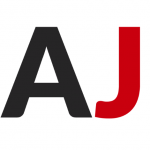 Part of an ongoing partnership to improve wheelchair accessibility for tourists in Kyoto. 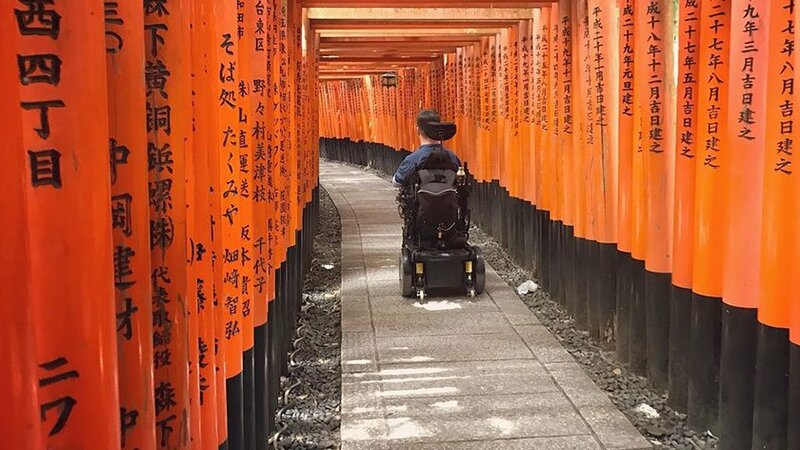 Firsthand experience confronting accessibility issues proved incredibly enlightening and gave me a story I wanted to share with disabled tourists hoping to visit Kyoto. Most of us take for granted how easy it can be to travel and visit our must-see spots once we arrive, but this is not the case for everyone. 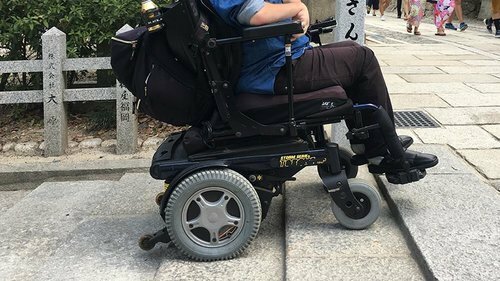 Travelers in wheelchairs face barriers – both physical and social – when exploring Japan that can be difficult to overcome. This is especially true in Kyoto, where many ancient temples and historical sites don’t offer the same level of accessibility and comfort that modern structures are built with. Castles simply weren’t laid out for wheelchair ramps, and most temples don’t have anywhere to put an elevator. This is a frustrating challenge many people don’t consider, and we’ve blogged about this before. Thankfully, Accessible Japan has been working hard to make sure that all travelers – regardless of ability – can enjoy a vacation in Japan. 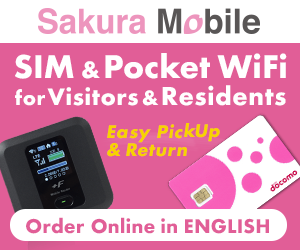 I’ve partnered with this organization in the past to provide info and support regarding accessibility in Kyoto. 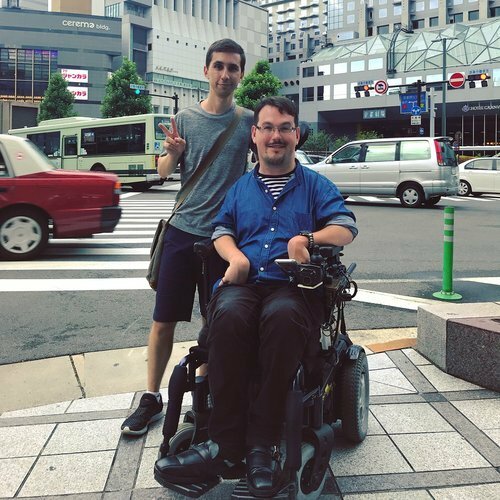 Last month, I had the exciting opportunity to host Josh Grisdale, the founder of Accessible Japan and a wheelchair user, to Kyoto and explore the city with accessible travel in mind. This gave us valuable insight into the challenges that some travelers can face in the city, but we also made some positive discoveries along the way. Instead, we decided to take another route, making a detour through a residential neighborhood and up to a flight of narrow flight of stone steps. These stairs are quite shallow, only a few centimeters high, but still could present a problem for some wheelchairs. During a year-long construction project here recently, this staircase was turned into a ramp by laying some asphalt to accommodate trucks and wheelbarrows. Why they couldn’t make this permanent is beyond my understanding, and it just shows how easy it can be to make these sites wheelchair-friendly. The stairs proved doable in a wheelchair, but it required some work and patience. Various models of chairs or visitors with different levels of comfort may have a hard time here, but I think it’s mostly accessible. I was really satisfied to get Josh up to the torii gate tunnels and into the inner shrine, especially after a shrine staff member the day before told me that it would be impossible and not to even try! Did they really think a shallow flight of stairs would stop us?! This is a famously iconic and oft-requested Kyoto spot that all travelers deserve access to, so it felt really good to make it happen. Thanks to some research ahead of time, I knew our next destination would be smoother sailing, but first we had to get there. I had rode the subway with Josh in Tokyo before, and found it to be a surprisingly normal experience. I mean, it is a normal experience for Josh, who has to use public transport daily, but I had assumed it would be more of an ordeal. In Kyoto and in Tokyo, we notified the station staff where we wanted to go and they brought a foldable ramp to help us onto the train. Someone was waiting at our destination and helped us all the way up to street level with a smile. Overall, it was a really pleasant experience. Our next sightseeing location was Sanjusangendo, which has always been one of my favorites in Kyoto and one that I try to include in as many of my tours as possible. The staff there assured me that things would be easy for Josh when I inquired about access the day before, and they were right. Sanjusangendo should be seen as THE gold standard for how Kyoto’s historical sites can adapt to wheelchair users. Not only is everything ramped and safe, but the overall tone that the temple takes towards disabled visitors is extremely positive and welcoming. Just look at their sign outside the temple: “Wheelchairs are welcome.” Perhaps it’s no coincidence that this temple is dedicated to the Buddhist goddess of compassion! Sanjusangendo should absolutely be on the list of any traveler to Kyoto, and thankfully it’s not off limits for those in wheelchairs. And as always, I advise you not to google this place too much before you visit. It’s better to let the unbelievably special display inside surprise you. You will love this one! Before moving on, we headed across the street to stop for a break at Kanshundo Shichijo teahouse. The main building requires a large step up to access the interior, but the staff was happy to accommodate us in other ways. There are several tables outside that are accessible, but it was hot day so we sat a small counter space that is not usually used for guests and enjoyed some matcha tea and ice cream. Many matcha tea activities would be off limits to wheelchair users due to the nature of tea house architecture, but this was a nice way to still experience some great tea and sweets in a traditional atmosphere. We even picked up a few sweets in the shop there to snack on later. After another subway ride, we arrived at Keage Station and set out to explore the Nanzenji area. Dark clouds were rolling in, but we’d be fine, right? There’s a lot to see inside the Nanzenji temple complex, but unfortunately much of it is not accessible if you want to see interiors. Luckily, there’s plenty to see outdoors here. The grounds themselves are beautiful, with groves of maple trees making this a top spot for autumn foliage in November. Leading up to the main temple is a massive wooden gate that is absolutely still worth admiring even if you can’t access the gateway itself in a wheelchair. However, you can pass under a gate of sorts nearby. Large arches in western-style brickwork hold up the Biwako Aqueduct, bringing water from Japan’s largest lake on the other side of the mountains in east Kyoto. It’s a really picturesque spot, especially in autumn when the leaves change. Even though it wasn’t on our original itinerary, we decided to stop at the main temple at Nanzenji and check out the accessibility there. Nanzenji is something of an oddity when it comes to wheelchair access. The entire inside of the complex is accessible. Ramps are placed over each and every single step and bump, and wheelchairs are available for use inside the building. However, getting into the temple requires visitors to transfer from their own chair into one of temple’s own and be carried up several steps in the entryway (pictured). We managed to get inside with no issues, but it puzzled me that a temple could be so perfect on the inside but make it so tough to get past the front door. 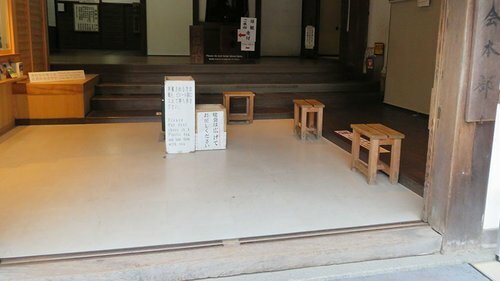 We had a suspicion that there might be another accessible entry point somewhere else in the building that was not open for us, so Nanzenji remained tantalizingly close to being a great accessible spot apart from the entryway. Another example of something that could be adapted with minimal effort to allow everyone to enjoy the temple’s inside. As we made our way through the amazing Zen gardens and intricately painted rooms of Nanzenji, the skies opened up and dumped a massive amount of rain on us. Soon we were in the midst of one of the strongest downpours I’ve ever seen, accompanied by some serious thunder cracks that you could feel in your bones. This delayed us for about and hour, but at least we had some wonderful views to admire as we waited for the rain to let up. We had originally planned to visit one more spot in the area. Eikando Temple is known for it’s accessibility, and has several elevators cleverly worked into the temple architecture that you don’t even notice as you walk through the covered halls. Our rain-delayed arrival was too late to enter that afternoon, but the staff outlined the accessible route that we could take through the complex and it seemed highly reasonable and doable. The main Buddha statue here is a famous piece that tells a great story about the deity’s ability to walk, so this temple is a fairly important place for worshipers who want to pray for issues dealing with leg disabilities. 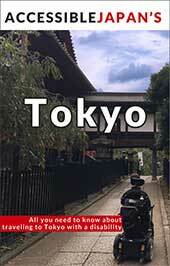 This will definitely be on the list for future accessible excursions to Kyoto. In many ways, my day with Josh was a challenging experience. I was constantly on the lookout for details in architecture that limit accessibility, and learned that my assumptions were sometimes incorrect. Steps that I thought would be impassible, he was willing to attempt. Accepting assistance from staff to lift his chair into the temple was something that I saw only a positive, but Josh reminded me that some guests cannot easily transfer due to medical reasons or others may find it embarrassing. 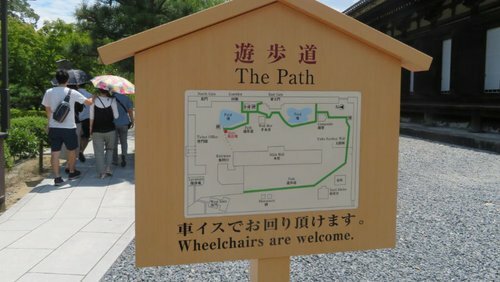 Keeping accessibility in mind forced me to see Kyoto in a whole new light. Yet at the same time, it was a regular tour unlike any other. We still discussed the usual interesting cultural details that I enjoy pointing out, and Josh asked some of the same touristy questions I’ve heard a million times. (Sorry, Josh.) 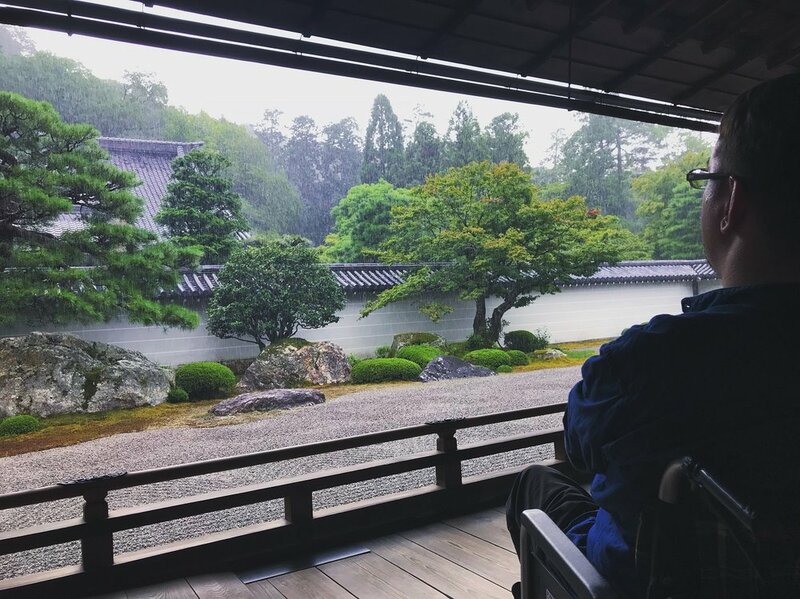 This only reinforced the idea that disabled travelers deserve to experience Kyoto like anyone else, and can do so with a bit of work and planning.